Letters from Mom 1991-1993: Thank God for Computers! Up and off to get my nails done at 10:45. I brought home chili dogs for lunch. I worked on the laundry and did some typing. I tried to finish my memories of Arkansas. I wrote it 3 years ago and want to type it but my typewriter broke down again. At 7:30 we went square dancing. This is the first night of the new class. We have a good time seeing friends. After dancing til 9:30 we go to Hudson's Grill with 25 friends til 11:00. Sleeping very well. Trying to do visualization at least once a day. I relax and go inside my belly. I paint all the cancer and tumors with a big paint brush dipped in potent medicine that shrinks and kills cancer. Mom's journal and all her letters that I saved are handwritten. I know that computers were around in 1992, but not near as common or easy to use as they are today. 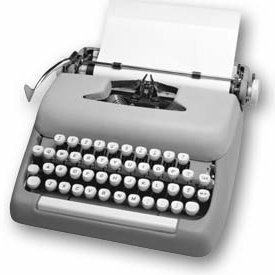 I can just imagine Mom struggling with an old typewriter like the one pictured above. Thank God typewriters have been replaced by computers, where you can type quickly, easily make corrections, print and save electronically. Not only that, but with a web-based program like this one, it is there for all the world to see years in the future. Too bad I never came across her memories of Arkansas. I'm sure she put alot of work into it as she did with her journals.